The past week has been buzzing with news of Superstar Rajinikanth's daughter Soundarya's wedding with actor/businessman Vishagan Vanangamudi. Now, the two are officially married! 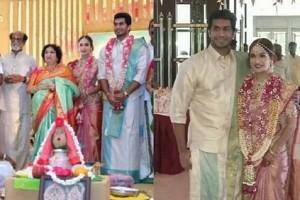 According to recent reports, Soundarya and Vishagan tied the knot today at The Leela Palace hotel in Chennai. The wedding festivities began a few days ago with the pre-wedding reception held on February 8. A combined sangeet and mehendi ceremony was held on Saturday. Another reception for family and friends is scheduled for today's afternoon. Many famous personalities took part in the event including Tamil Nadu Chief Minister Edappadi Palaniswami and Makkal Needhi Maiam leader Kamal Haasan.